Mark Yee, a 25-year banking industry veteran, was recently named Senior Vice President and Chief Lending Officer at Albina Community Bank. Prior to his appointment at Albina, Yee held roles of increasing responsibility at U.S. Bank. Most recently, he was a Senior Vice President and Small Business Region Manager at U.S. Bank. In 1982, he started his banking career as part of a work study program at Portland State University. 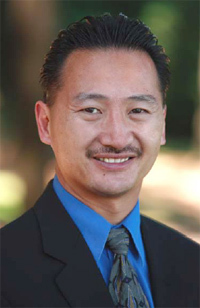 Since then, Yee has held a variety of positions at the branch, district, and regional levels with U.S. Bank and the former Portland Teachers Credit Union. The fourth-generation Chinese-American has deep roots in the Pacific Northwest. Born and raised in North Portland, Mr. Yee is a graduate of Jefferson High School. During a recent interview, he shared his perspective on his new role at Albina. What has drawn you to serve at Albina? I’ve been in the banking community since high school at Jefferson, and have followed Albina since its beginning ten years ago. When I worked at other banks in the city, Albina was always viewed as competition. One of the things that was very difficult to compete with them on was with their mission, that fact that they’re local and they’re here to serve the community. A smaller bank is more community-focused, and that was something that was attractive to me. I’m at a point in my life where I want to make a difference and add value in the community. Albina’s mission of commercial revitalization, building small businesses, and creating jobs in our local neighborhoods sets it apart, and I’m excited at the opportunity to contribute my knowledge and passion for our local community to support this mission. What is your most important charge as Chief Lending Officer? The most important charge is to grow loans and deposits and to create a strong sales environment, with a consultative approach to our clients. We’re a bank, but we also have a mission to help the community. It’s an interesting interaction between the two, and we’re consistently working to find that right blend of growth and mission. What’s your strategy for exceeding lending and deposit goals at Albina? That’s the question of the hour. Primarily, it is to create a stronger sales and service environment, and to be more proactive in the business community. It’s important to create a strong strategic plan and then manage to the plan. I hope to add more structure and processes to improve our consistency and effectiveness in the community. Albina will additionally continue to focus on building relationships with customers and the community so that they feel well cared for and empowered with financial knowledge. This level of service intimacy additionally sets Albina apart. Albina employees also take pride in our mission to “create hope and financial opportunity for the economically underserved by building lasting banking relationships with those who care most about our community. In 2005, Albina’s 43 employees donated close to 4,000 hours of community service. Our focus is to find a way to fill the financial needs of our community, while being an active part of that community. How does Albina excel in supporting small businesses? At Albina, we understand that small businesses are the toughest, most exhilarating challenges on earth. As a local bank, Albina has developed a deep understanding of our local community and the unique needs of small and growing businesses. Albina takes the time to learn about our business customers’ needs and then we advise them accordingly. We don’t rely on a “one-size fits-all” solution for our clients, but work to develop unique approaches that are customized to each business’ situation. What programs are in place at Albina that meet the unique needs of minority business owners? What really makes us unique is that much of our outreach is focused on low to moderate income and minority communities that mainstream banks are generally only reactive to. We know what great markets they are, and are very excited to partner with these communities. Albina is just one of 57 commercial banks in the country certified by the U.S. Treasury as a community financial institution, and we’re also proud to maintain our minority-ownership which means that more at least 50% of ownership is held by minorities or women. Albina additionally works hard to ensure that our employees reflect the faces of our diverse community, and has accomplished a cumulative employee diversity score of 43% since tracking began in 2002. At the beginning of 2006, Governor Ted Kulongoski and the Oregon Economic and Community Development Department (OECDD) presented a $250,000 grant to Albina to create a $750,000 Microenterprise Loan Fund. This loan fund provides loans and lines of credit up to $50,000 to small, emerging, women, and minority-owned businesses that might otherwise not qualify for bank loans. Through a partnership with various service providers, applicants are offered assistance in preparing applications and business plans in both English and Spanish. Last year, Albina also began a partnership with Metropolitan Family Services’ Ways To Work program. Ways To Work provides qualified working parents who are unable to get funds elsewhere with loans to purchase, repair, or refinance a car for work, childcare, and school-related transportation. This is the first program of its kind in Oregon, and is operated locally by Metropolitan Family Service in partnership with Albina. In partnership with MercyCorps Northwest, Albina offers The Asset Builder Individual Development Account (IDA) program that provides training, individualized case management, and technical assistance for disadvantaged entrepreneurs. As part of the IDA program, participants are required to attend a six-week workshop series that focuses on financial education and business basics. Upon successful completion of the program, savers receive a matching grant of $2 for every $1 saved to purchase assets for their business. Albina is the bank of choice for this IDA program to assist their new business owners in the matching grant program. Albina additionally provides IDA accounts to eligible low-income individuals and families working with the Portland Housing Center to buy their first home. As PHC individuals and families save money for their down payment and closing costs, Albina is the bank of choice for these Individual Development Accounts (IDA’s) and additionally provides a “How To Save Workshop” for first-time homebuyers, and a special CD rate for eligible individuals and families. What top criteria are used by Albina in making lending decisions? The top criteria are the same as other top lending institutions: Does the business plan make sense? Does the business have adequate capacity to pay their debts? Do they have a secondary repayment source to fall back on, such as collateral? Do they have a history of paying their debts on time? At the same time, Albina doesn’t rely on a “one-size-fits-all” lending solution for customers, and we will work to develop unique approaches that are customized to each situation. We try to be as creative as possible so that we can structure a plan that will be a win-win for both the bank and the customer. In your experience as a banker, what are some of the biggest hurdles faced by emerging firms? Many startup businesses do not have a sound business plan. Some do not have the support or are not utilizing support of advisors or mentors to create and execute an effective plan. The best way to overcome that obstacle is to utilize all the resources that are out there. There are many programs that are aimed strictly at businesses that are just starting out or trying to make it to the next level. From your experience working with small businesses, what trends or significant developments have you seen over the years? Over the last 25 years, it’s been great to see the increased support for small businesses. There’s a lot more resources out there and more focus on the success of small businesses. From the perspective of financial institutions, many medium-sized banks have merged to form large banks. This has opened the field for more small, community banks that have surfaced in recent years. New banks are forming, and smaller banks continue to do fairly well. What is the most crucial piece of advice for any startup business? Form an advisory team, people you count on who have been business mentors previously. A professional advisory team will help you build a strong foundation. Make sure you include you banker, your accountant, your attorney. Also, use the tools and resources available out there to small businesses to develop a solid business plan. Think out what you’re doing prior to launch. Constantly look at how you are performing to that business plan, to determine if you need to revise the plan or revise what your activities are. How are you finding your new role? I am enjoying my new role at Albina. I’m learning something new about our community and how a community bank does business each day. It’s a lot different with a large bank where functions tend to be more specialized and departmentalized. In a smaller community bank, employees have the opportunity to learn a lot more about the overall operation of a bank and its real effects in our community. This process has been very fun and exciting for me.